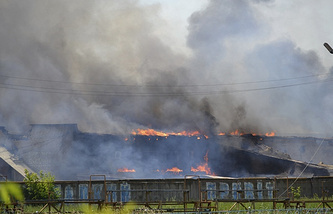 ROSTOV-ON-DON, June 09./ITAR-TASS/. More Ukrainian refugees are expected to arrive at temporary accommodation centres in Russia's Rostov region as people try to leave besieged towns in southeast Ukraine after Sloviansk was again shelled on Sunday. Refugees say towns and cities in the southeast are surrounded by the Ukrainian National Guard army, which does not allow residents trying to leave the shelled zones, to reach the border. "Everything depends on those who are on duty there. Some let people out. Others turn all back," Tatyana, one of the refugees, told ITAR-TASS. "When we were leaving, they said we would never return, that nobody would be allowed back from Russia," she said. About 20,000 women and children from southeastern Ukraine have crossed the Ukrainian-Russian border to the Rostov Region in the last three days. Over the last day 7,335 Ukrainian citizens entered the Rostov Region, the regional government said on Monday. On June 6, more than 12,000 Ukrainian residents were reported to arrive in Russia. After leaving cities and towns in the southeast, which are in the zone of fighting, most of the people move farther via Rostov. Some remain in temporary accommodation centres prepared by the Rostov region's authorities for refugees. "Out of the 7,335 citizens who have arrived at the Don, 4,272 have already left, and 326 Ukrainian citizens, including 164 children, are accommodated in the region," the government press service said. There are 2,102 people, including 930 children, accommodated in 15 municipalities of the region. Local families have taken 1,070 people, including 431 children, to their homes. Fifty seven adults and one child are in tents in temporary accommodation camps. The press service said 263 people received psychological care. Regional authorities organized transit to the Voronezh and Moscow regions for 133 people. 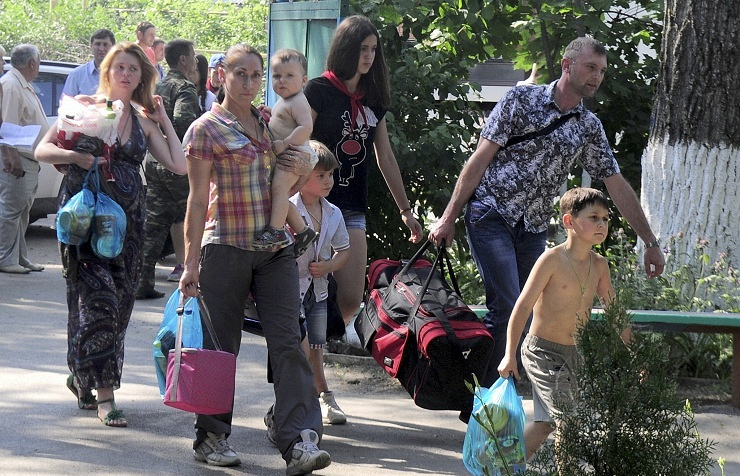 Activists of the self-proclaimed Donetsk People's Republic are organising evacuation of women and children. 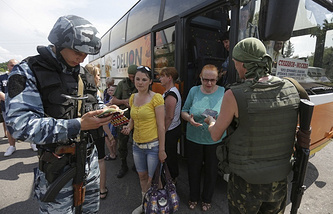 According to their information, more than 700 people are registered to take buses in Sloviansk. All are warned that they may have to go on foot out of the city and there may be tripwire on the way. Self-government is organised in the largest camp, Dmitriadovsky, where elected leaders distribute humanitarian aid. Federal Migration Service authorities in the Rostov region and the regional employment centre are helping refugees find jobs and settle problems with documents, delivering their services directly at camp locations. Children are having medical checkups in the camps. Each is registered and has a medical card. A local doctor said the children needed psychological care first of all. They are emotionally exhausted, many suffering stress overnight when hearing a thunderstorm they mistake for bombardment. "Residents from Ukraine continue to arrive in Russia," Vasily Malayev, a spokesman for the regional border guard department, told ITAR-TASS.